What a fresh interpretation of modern farmhouse styling. Striking from every angle, this chest of drawers merges a simple, straightforward profile with some exciting twists. 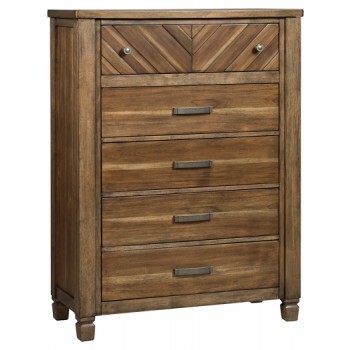 A chevron patterned top drawer and a mix of antiqued pewter-tone pulls and knobs perfectly punctuate this rustically refined statement piece.